What did it mean to be a professional teacher in the prestigious "liberal schools"—the schools of grammar and rhetoric—in late antiquity? How can we account for the abiding prestige of these schools, which remained substantially unchanged in their methods and standing despite the political and religious changes that had taken place around them? 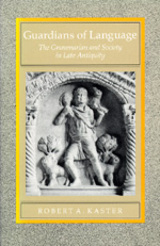 The grammarian was a pivotal figure in the lives of the educated upper classes of late antiquity. Introducing his students to correct language and to the literature esteemed by long tradition, he began the education that confirmed his students' standing in a narrowly defined elite. His profession thus contributed to the social as well as cultural continuity of the Empire. The grammarian received honor—and criticism; the profession gave the grammarian a firm sense of cultural authority but also placed him in a position of genteel subordination within the elite. Robert A. Kaster provides the first thorough study of the place and function of these important but ambiguous figures. He also gives a detailed prosopography of the grammarians, and of the other "teachers of letters" below the level of rhetoric, from the middle of the third through the middle of the sixth century, which will provide a valuable research tool for other students of late-antique education. Robert A. Kaster is Kennedy Foundation Professor of Latin Language and Literature and Professor of Classics at Princeton University.